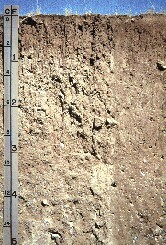 Soil profile of the Scoby soil, recently named the Montana State Soil. Soil Test give us important information about the nutrient content and the quality of the soil. It does not matter if the sample comes from a field, a pasture or a garden, the information is just as important to that grower. For farmers, a good soil test is the first step in crop planning. Cropping decisions can be made based on the Plant Available Water stored in the soil. The soluble salts and sodium levels in the soil tell us what the soil quality is and can determine what crops we can grow. The PAW gives us the amount of water stored in the soil so we can estimate the yield potential of the chosen dryland crop. Economic decisions can then be made based off of yield potential and residual nutrients.This is the base for estimating how much and what kind of fertilizer the grower needs to apply grow the desired crop. Dryland Pastures and hay fields will also benefit from using this information to estimate yield potential and fertilizer requirements.Lawns and gardens normally look green and healthy and produce good vegetables for the family. A soil test contains important information to insure that the nutrients are in balance. We also make sure there are no salt or sodium problems, which may affect production. When in doubt, don’t guess, take a soil test. There is more information about Montana’s soil profiles at the USDA. We do water testing for livestock and irrigation quality. Given the high salts in your customer’s soil, it makes sense to ensure that the well irrigation water is not contributing to the problem. To take a water sample, the easiest way is to take an empty plastic water bottle, and rinse it out with water from the well a few times and then fill it up. A pint bottle is sufficient.